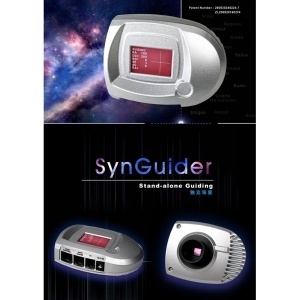 The revolutionary, stand-alone auto guiding tool, SynGuider is born! Equipped with Sony CCD image sensor and the real-time star image display screen, SynGuider can work independently without a computer or calibration software. You will be saving significant power while working in the stargazing field with a limited electricity power pack. The SynGuider is adaptable to main telescopes with T-ring (M42) and 1.25" eyepiece holder, and can control EQ mount with a standard auto guider interface. SynGuider is ideal for Digital Single Lens Reflex (DSLR) users, while saving you the trouble and need for a computer to control your imaging system. It will greatly improve your efficiency and productivity during astro-photography sessions. SynGuider will allow you to obtain pin-point stars during long exposure process to make your work simple and fun!